Leaning over the brand new 2009 Royal Enfield Bullet, Royal Enfield engineer Hari Kumar was demonstrating how a dealer can use software on a laptop computer to diagnose problems. I asked him what a rider could do on the roadside if and when the Malfunction Indicator Lamp (idiot light) comes on. Kumar pointed to the five connections to sensors around the bike. The rider could make sure they're all still connected. That's all. Designed to be trouble free, the new unit constructed engine (UCE) Royal Enfields are also designed to do without intervention by the rider. That's why Pete Snidal, author of the definitive owner's and workshop manual for Bullets of the past, plans no edition for the UCE. "It won't be a bike for the DIY (do-it-yourself) kinda guy, so no manual required. At least not from me," Snidal told me. He is prepared to believe it is possible the new Royal Enfields could get by without one. "My first impression is that they did remarkably well incorporating present-day tech with the basic spirit of the original Bullet..." he said. "I'm pretty impressed with the Japness of the whole thing! Obvious where they got their ideas from, but then it seems like yesterday I was looking at the first Kaw(asaki) imitation BSA 650, and we know what a fine job they started doing from there. It IS a global world out there these days; no reason why India couldn't get an oar in the water." 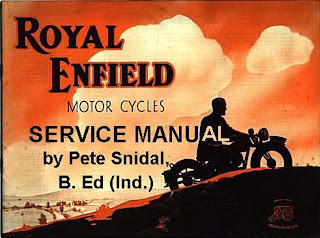 The old-time Bullets, in production virtually unchanged in India for 50 years, needed occasional tinkering by owners, and Snidal's manual helped them do it right. Properly cared for and rebuilt when necessary, those Bullets could last seemingly forever. Therefore, they aren't going away anytime soon. "I have a feeling there'll still be a lot of Bullets on the road after the last UCE dies," Snidal said.